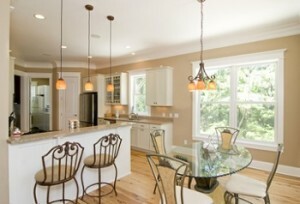 In part one of this article, we talked about ways to add artificial light into a dark kitchen. Here we will journey into the world of natural light. Are you lucky enough to have a home with a backdrop of the Blue Ridge Mountains? Can you imagine seeing something so beautiful every time you walk in the kitchen? Even just looking into a back yard full of flowers is enough to lift your spirits and connect you with the outdoors. Designers can create almost any type of window nowadays, so don’t disregard any ideas until you actually research them. Everyone’s space is different, but if your kitchen is large enough (and in an ideal location), consider removing your boring wall and replacing it with a wall of windows for a dramatic approach. If the space does not allow, you may be able to increase the size of your current windows, or have several smaller windows installed. If you need to increase your storage space think about framing your windows with cabinets. Do you have a kitchen or an eating area with a standard door leading to the outside? To open up this space, replace the existing door with a glass door, install beautiful french doors, or put in sliding glass doors. There are tricks to bring in natural light even for those of you who don’t have a stellar view. A skylight in your ceiling would be a great way to fill your home with sunlight, while saving you money on energy bills. If you want windows, but don’t have a spectacular view, get to work and create your own! Design a landscape garden in your back yard with a border of tall shrubs. This way, you can still add large windows for natural light, while also creating something appealing to look at. If you simply do not want to see any more of your outside space, or you have nosy neighbors that would delight in the clearer window view, ask about installing windows just below the ceiling line. This way you’ll still get natural light, while maintaining your privacy. However you decide to brighten up your space, you won’t regret it. Whether your kitchen welcomes artificial or natural light solutions, you’ll find that your newly lit kitchen will make your kitchen more inviting, and have positive effects on the mood of you and your family.